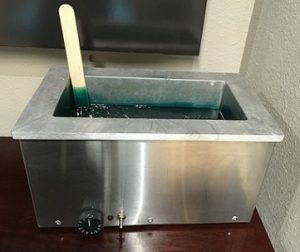 There are three main types of wax that wax centers will choose from for their clients; hard wax, soft wax and sugaring. Here we describe the benefits and downfalls of all three so you can understand the importance of going to a salon with quality wax. Soft wax is thinner and requires a muslin strip to be placed on top of it before you can pull it off. This type of wax sticks to the skin, not the hair. Because of this, you cannot go over the same area more than once. If you do, there is the risk of accidentally lifting the skin with the wax strip. Lifting the skin is the biggest problem since it will be left exposed and will scab over and possible scar. Soft wax is more common since it costs less. This is because the Esthetician uses less per waxing appointment. Sugar wax is a type of thick gel made of sugar, lemon and water that is used to pull the hair off the skin. Many people try to wax themselves by making this sugar wax at home. The process of sugar waxing is not sanitary because you are supposed to reuse the same wax multiple times, creating a giant ball of hair in the end. Gross! Hard wax (also called European wax) is thicker and does not need a muslin strip to be pulled off. We simply let it dry and pull the wax off. Hard wax adheres to your hair, not the skin. The result is much safer since the wax does not stick to the skin, like soft wax. There is significantly less of a risk of lifting the skin using hard wax, compared to soft wax. Many companies opt out of using hard wax since it is more expensive than soft wax. This is the type of wax that we use here at HK Wax Center – Austin Arbor. We only want the best results for our clients!